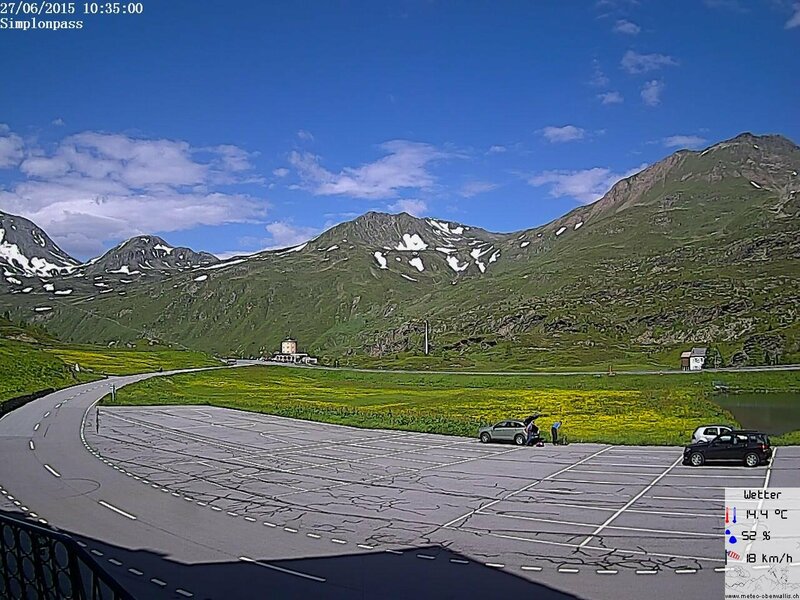 Simplon Pass – ‘among the Alp’s most beautiful crossings’ – might be a well-trod freight route between Switzerland and Italy but thanks to that there’s no easier way to get above 2000m, and it’s normally open all year round. Not exciting enough? Find the original pass road or drive Zwischbergenstrasse along Switzerland’s most remote valley. 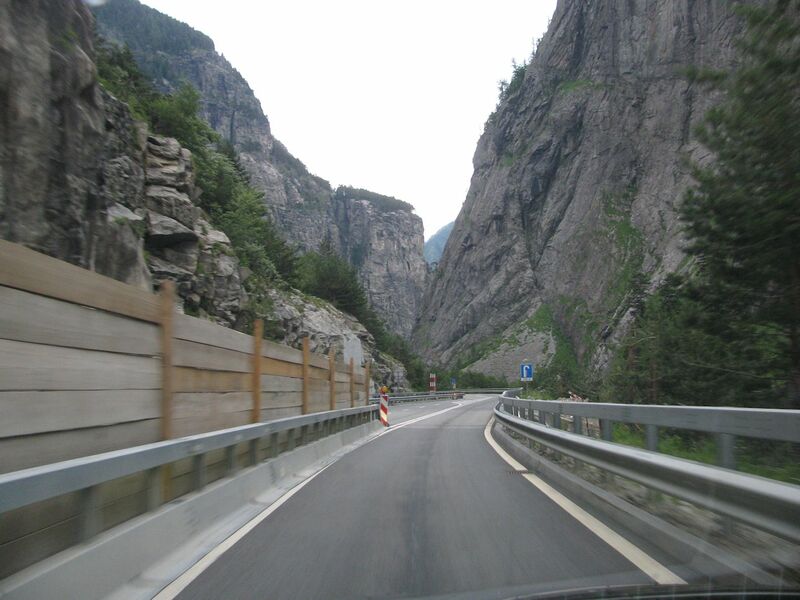 E62 Simplonpass – A9/H9 in Switzerland and SS33 in Italy – runs 66km (40 miles) from Brig across the Italian border to Domodossola, more or less halfway between the Mont Blanc and Gotthard Tunnels. The pass itself is 20km inside the Swiss border. It’s not fair to call Simplon Pass a ‘mountain motorway’ since it isn’t even dual carriageway (just occasional 2+1 lanes). But it is an important trade route between south west Switzerland and north west Italy, on the axis between Lausanne/Bern and Milan/Turin. Around 100,000 trucks drive this road each year. However, thanks to that it is open all year round – usually – despite topping out at 2005m (6575ft). The risk of avalanche in really heavy snow means it does shut occasionally so keep an eye on TCS during the winter months, or check out the webcam (see below). Should it be closed, the car train between Brig and Iselle di Trasquera costs 22CHF (€21) and takes twenty minutes. 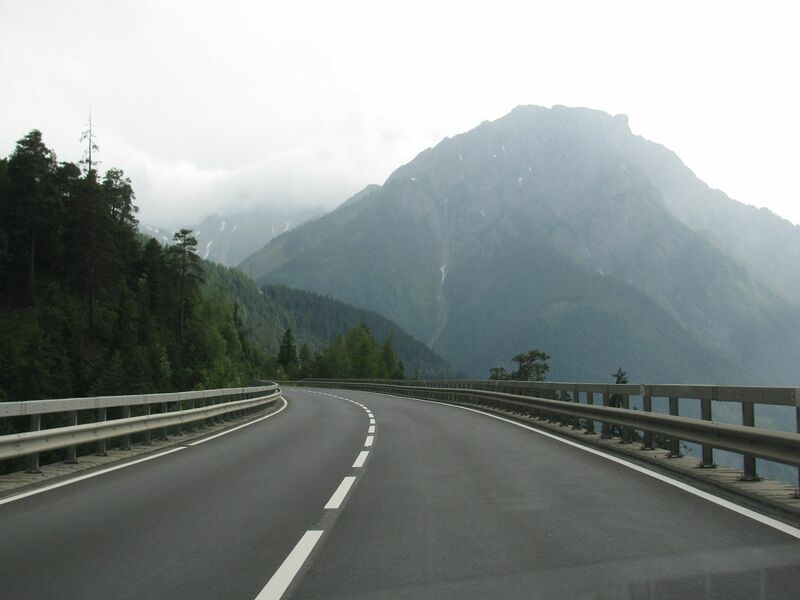 Otherwise, even beginners – or those nervous of heights – will enjoy Simplon Pass. With a maximum slope of 9%, and corners profiled for heavy vehicles, there isn’t an easier way to rise above 2000m. The only real issue at the moment is the three sets of road works, two on the north side and one on the south, all with alternate traffic. The northernmost is due to finish this year, the southern one next year, and the final one in 2018. 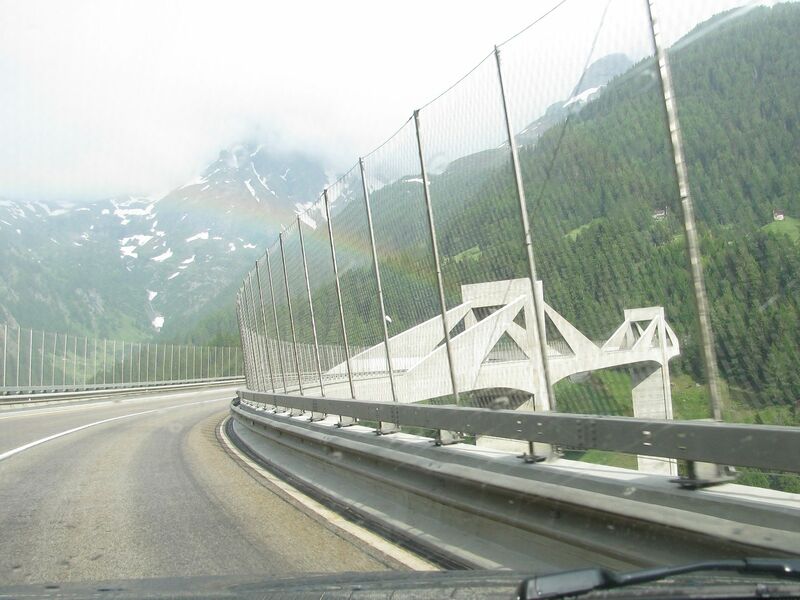 Apart from the usual stunning scenery – the Swiss claim it to be among the most beautiful crossings in the Alps – the standout features for us were the futuristic, concrete Ganter Bridge across the Ganter Valley in the north (Switzerland’s longest at 2.2km) and the narrow Gondo Gorge in the south with vertical granite walls. 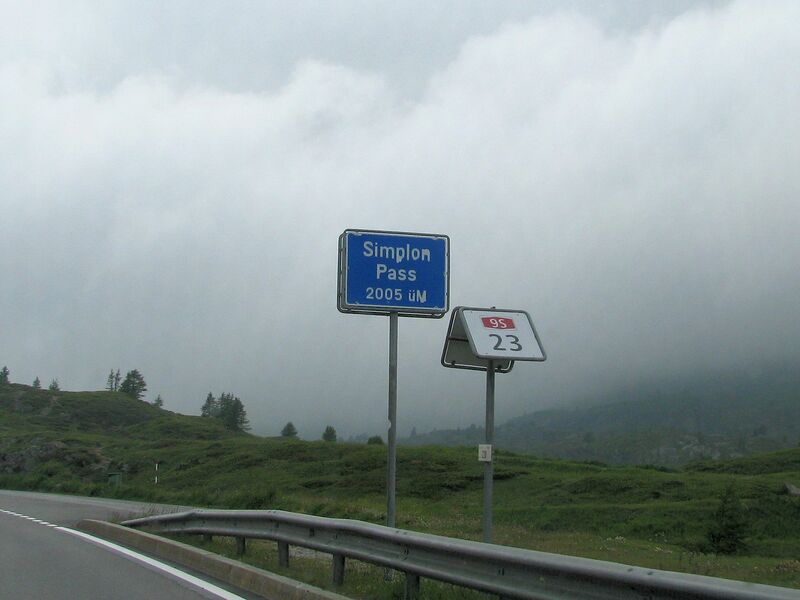 It was Napoleon who first paved Simplon Pass in the early nineteenth century. 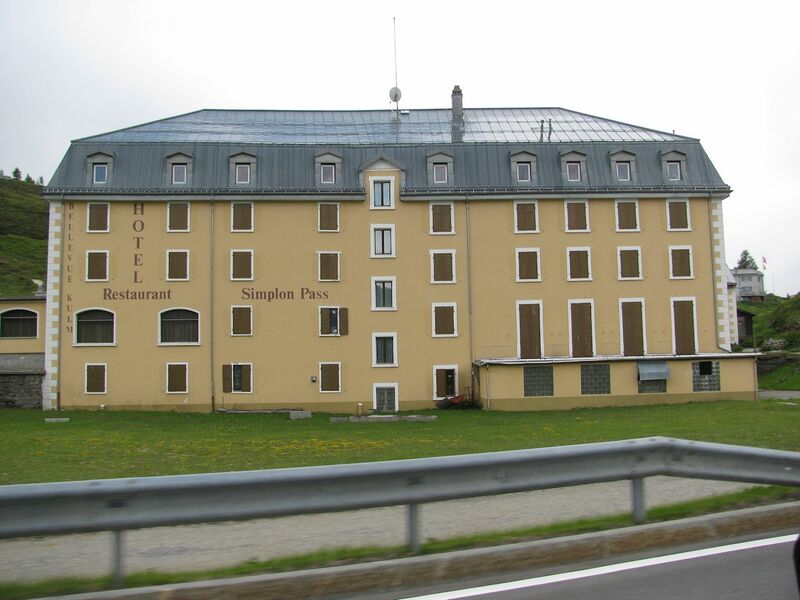 He also built the Simplon Hospiz, the largest pass hotel in the Alps, where double B&B rooms cost €60. Portions of the original ‘Simplonstrasse’ road remain at various points for those wanting more adventure – see map below – including a bypass of the Ganter Bridge. 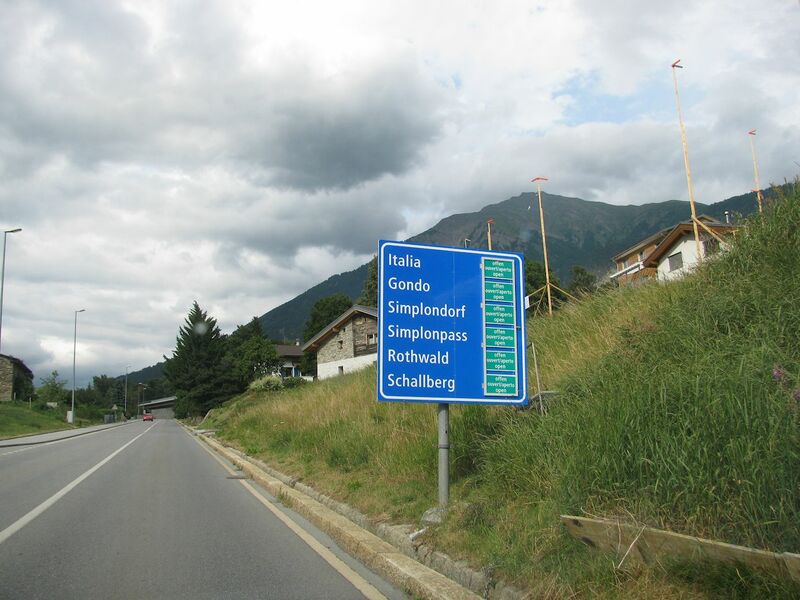 There are also myriad off-shoot roads, notably Zwischbergenstrasse from Gondo, up along Zwischbergertal, described as one of Switzerland’s most remote valleys. Simplonpass is the only pass road, as such, the others are all villages (except Italia, obviously). 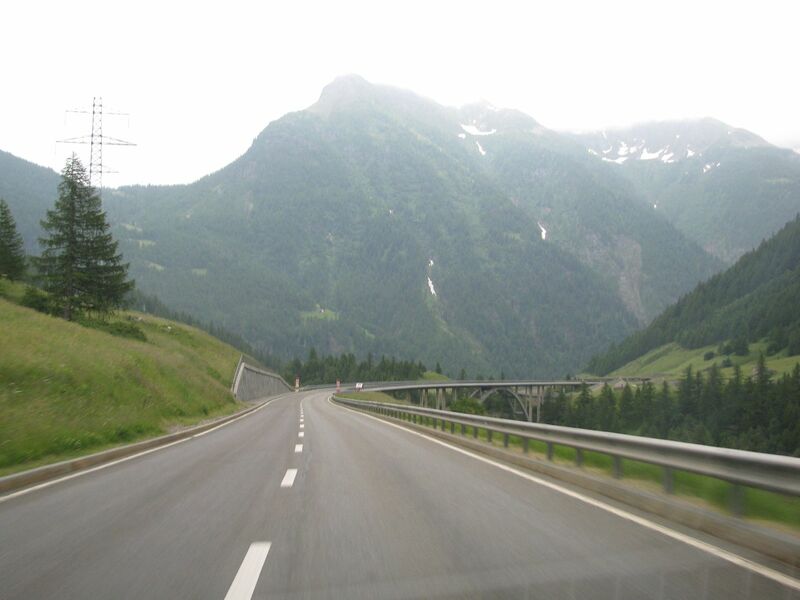 The pass cuts between the Pennine Alps in the west – with five peaks higher than 15,000ft – and the Lepontine Alps in the east, both in the Western Alps (also see Gotthard, Furka and Nufenen Passes). The highest Lepontine peak is Monte Leone (Lion) which overlooks Simplonpass to the east. The mountain above is Glishorn, a Pennine Alp – 2525m, 8284ft – which dominates the view south of Brig. The remarkable Ganter Bridge curves in an S-shape across the Ganter Valley, 150m above the Saltina River. 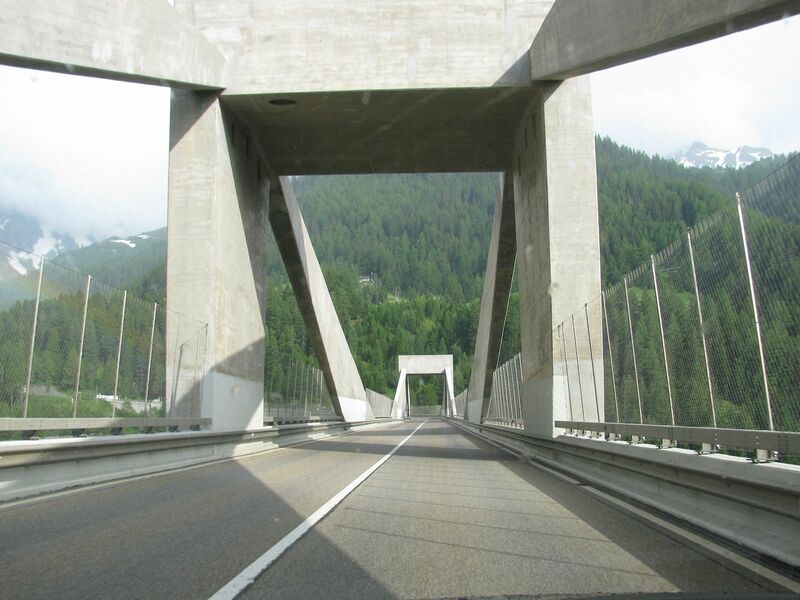 The unusual design is a ‘low-tower cable-stayed’ bridge, also called ‘extradosed’. It means the strength is derived from a combination of cables (here enclosed in concrete) and thick structural girders supporting the deck. It’s an expensive construction method but allows for an elegant form (no?). Considering Ganter Bridge – Ganterbruecke – was built 1976-1980 it is wearing extremely well. An unflattering view of Napoleon’s lead-roofed Hospiz taken on the hoof in rapidly descending cloud and rain (it was sunny and clear back down in the valleys). Despite looking shuttered-up the newly refurbished hotel is actually open all year round. Hubschhorn and Monte Leone provide the backdrop while the grounds on the other side run down to Rotelsee Lake. The descent on the south side is along the narrowing Val Divedro. 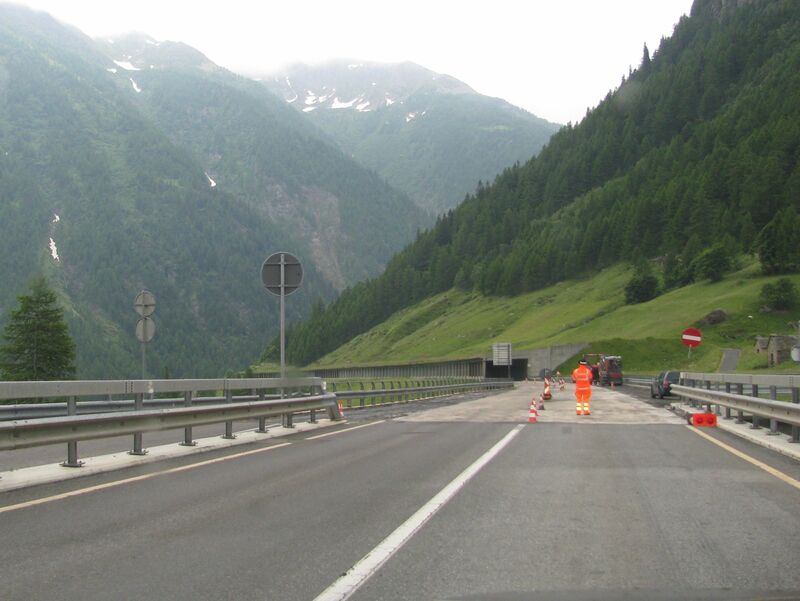 The third set of road works, between Gabi and Gondo, on the final run down to the Italian border. The long succession of open-sided ‘galleries’, the road popping out from time to time along the Diveria river, need refurbishing to protect against rock fall. A disastrous landslide in Gondo in 2000 killed thirteen. The path of the rockfall is obvious even today from the half rebuilt Stockalper Tower in the centre. The grand finale is the descent through Gondo Gorge. We have no complaints driving north to south but many say the views in the opposite direction, latterly head on to the Bernese Alps, are even better. 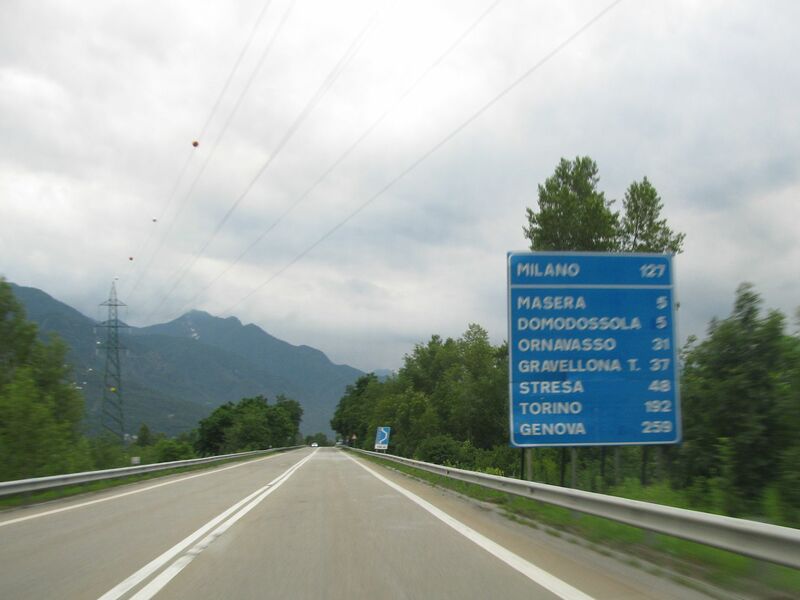 Soon after Domodossola SS33 turns to dual carriageway making the hop down to Milan even easier – though we made the Mediterranean, near Genoa, in only a couple of hours. To check real time weather conditions, and for all other tourist info, see Simplon.ch.